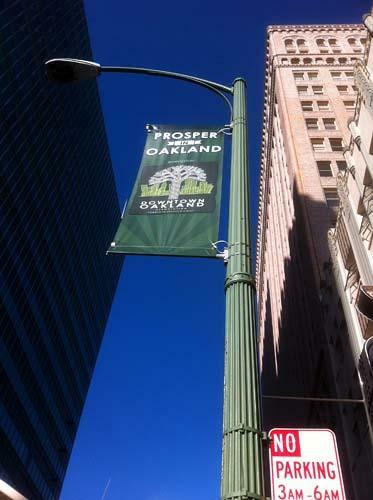 Only some businesses in Oakland prospered on Wednesday. 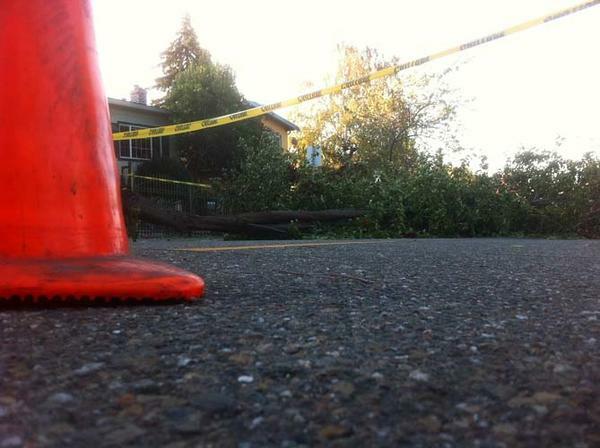 A block of Maple Avenue in the Laurel District was completely closed Wednesday morning due to a downed tree. 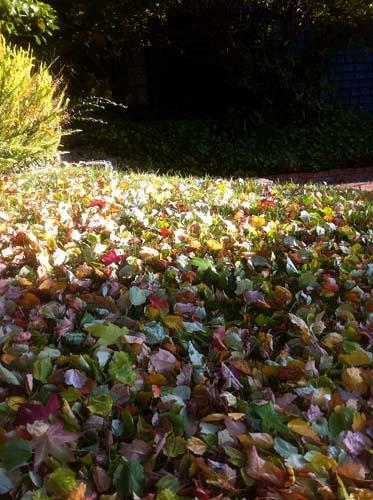 The first big blow of the winter season shredded thousands of leaves off trees and blew them into large drifts in the Glen Park area. 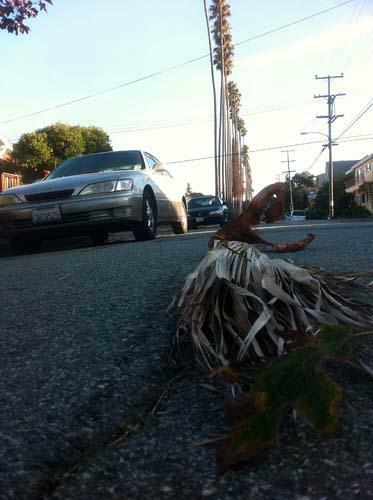 As though in sympathy with the strike the big winds tore down dozens of heavy, saw-toothed fronds from a line of 51 Mexican fan palm trees along Ninth Avenue planted by Francis Marion “Borax” Smith, certainly a member of the “1 percent” in Oakland a century ago. 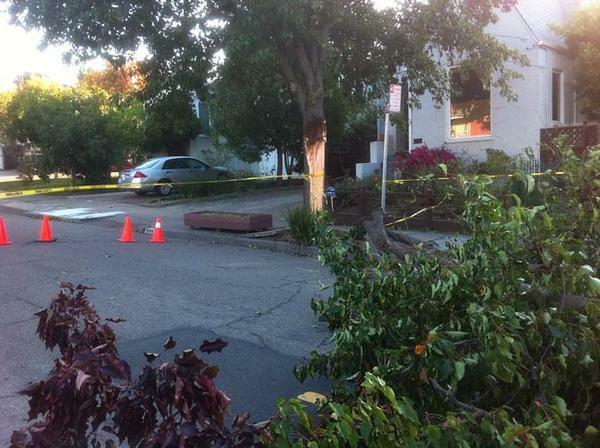 Storm debris was heaped along asphalt and sidewalk for several blocks beneath the tall trees. Alessandro Uccelli, a gondolier who rows Venetian gondolas on Lake Merritt, would not venture out on the choppy water Tuesday afternoon. “I’ve never seen it like this,” he said. Once they cleared up from the storm, businesses and residents had to face the protests, which shut down four or five blocks along Broadway centered on City Hall. 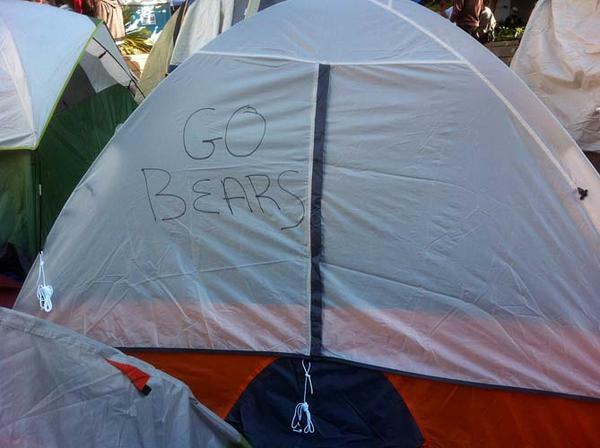 Though Oakland police cleared Frank Ogawa Plaza a week ago, it is once again a tent city. 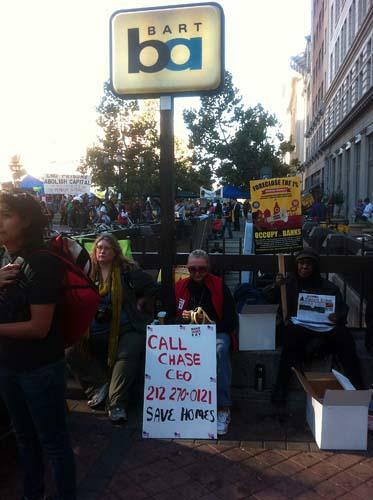 A variety of causes were supported by slogans in the tent encampment at Oakland City Hall. 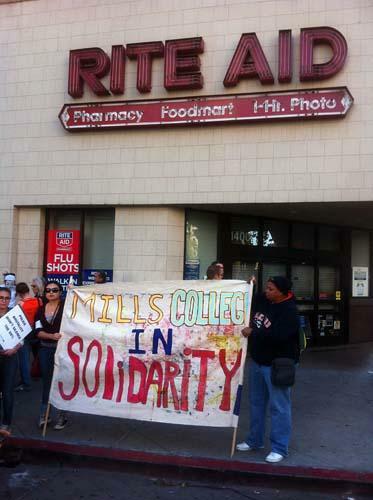 Some businesses, such as the Rite Aid pharmacy at 14th and Broadway, shut down. 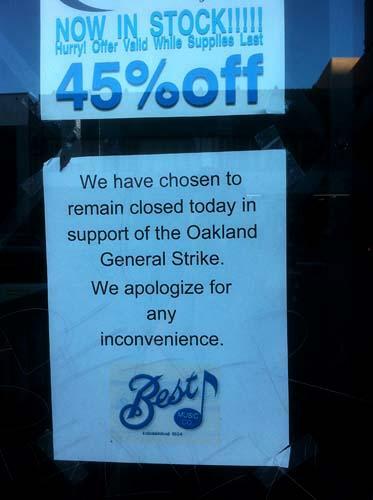 Some businesses, such as Best Music Co. at 19th and Broadway, shut down. 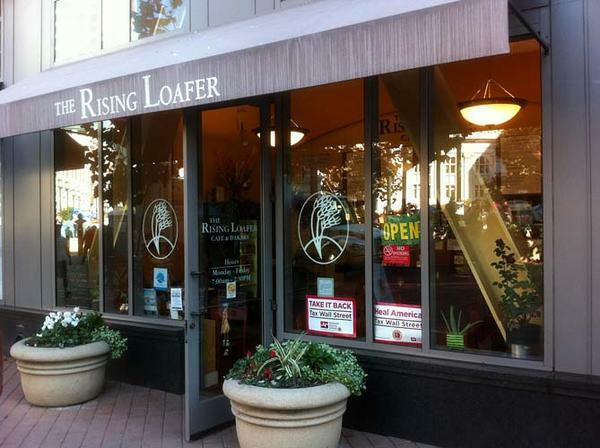 Restaurants and food shops, such as the Rising Loafer, were open, and doing a thriving business, much of it from hungry reporters and camera operators chowing down late in the morning. 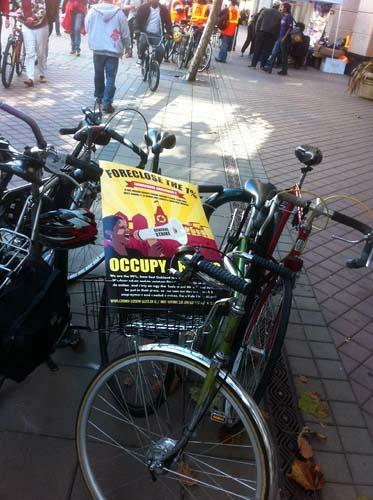 Many protesters came to Broadway on bicycles, thus avoiding snarled traffic and blocked public transit lines. BART continued to operate beneath the protest. 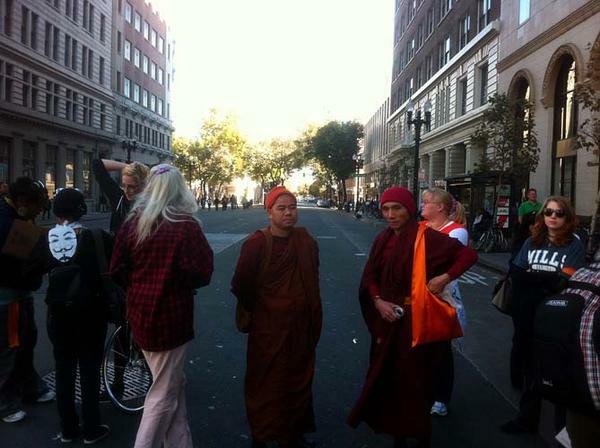 Even some monks came to the protest. Did they get Jamie Dimon’s direct line? 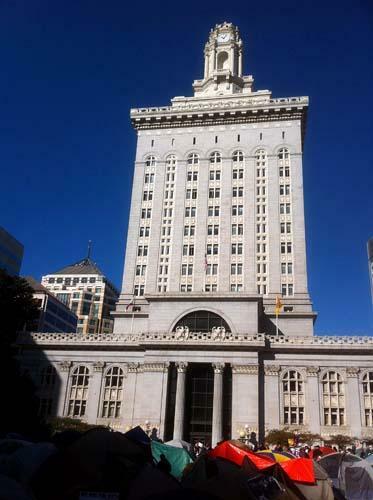 Residents and businesses in Oakland were hit by a double whammy as a violent windstorm blew through the city on the eve of a general strike and protest called by the Occupy Oakland movement. 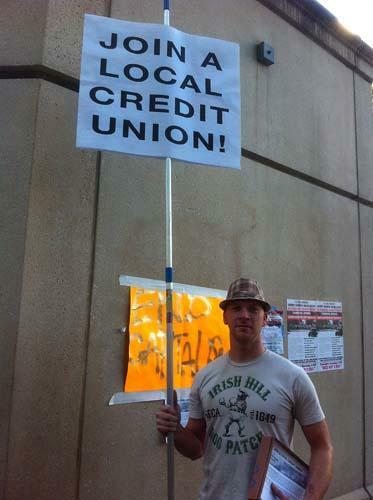 Though most neighborhoods of Oakland were quiet Wednesday morning — the protest and strike were confined to a few blocks along Broadway and to adjacent areas of downtown — residents everywhere had to clean up their yards, pick up or avoid fallen trees and big branches, and change their driving routes to avoid roads closed by storm damage. 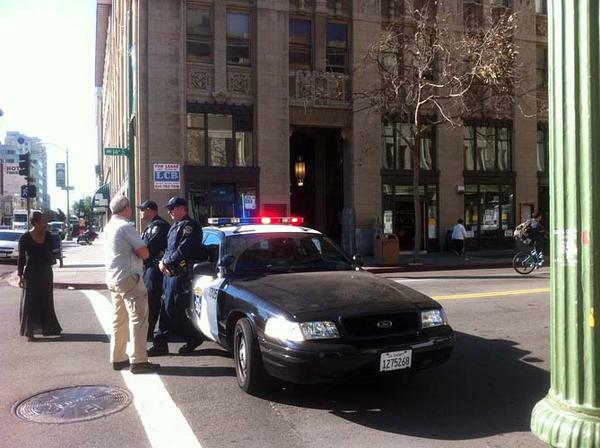 And that was before they changed their routes to avoid downtown Oakland, which police closed off Wednesday morning. A block of Maple Avenue in the Laurel District was completely closed Wednesday morning due to a downed tree, and drivers who use Maple as a quick, through route down from the hill neighborhoods to MacArthur Boulevard and Interstate 580 had to take a detour. The first big blow of the winter season shredded thousands of leaves off trees and blew them into big drifts in the Glen Park area. 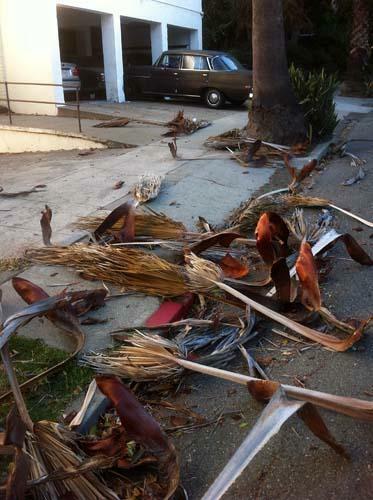 And as though in sympathy with the strike the big winds tore down dozens of heavy, saw-toothed fronds from a line of 51 Mexican fan palm trees along Ninth Avenue. The trees were planted by Francis Marion “Borax” Smith, who built his mansion on the hill near the intersection of Park Boulevard and I-580 and was certainly a member of the “1 percent” in Oakland a century ago. 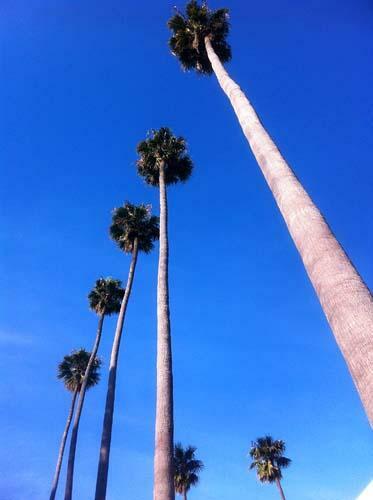 The trees marked the entrance to his palatial mansion where (so they say) peacocks and tame deer roamed the estate. Alessandro Uccelli, a gondolier who works for Gondola Servizio, rowing Venetian gondolas on Lake Merritt, would not venture out on the choppy water Tuesday afternoon. He cancelled his scheduled cruises after calling his boss. “I’ve never seen it like this,” Uccelli said. He said that during a similar windstorm, not quite as strong, it had taken him 43 minutes to row across the lake, but just seven minutes to return with the wind behind him! Once they cleared up from the storm, businesses and residents had to face the protests, which shut down four or five blocks along Broadway centered on City Hall. A vast tent city filled Frank Ogawa Plaza, and a smaller encampment had also returned to nearby Snow Park, even though city police expended considerable effort to clear both places just a week earlier. Some businesses, such as the Rite Aid pharmacy at 14th and Broadway, shut down, as did Best Music Co. at 19th and Broadway. Restaurants and food shops, such as the Rising Loafer and Plaza Cafe, both opening into the plaza filled by protesters, were open, and doing a thriving business, much of it from hungry reporters and camera operators chowing down late in the morning. Banks with roots in the city, such as Community Bank of the Bay, remained open, although Community Bank had its doors locked and customers had to ring a buzzer and wait for a bank employee to come and let them in. 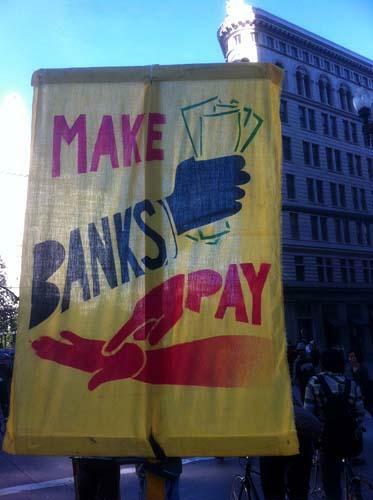 CEO Brian Garrett said Tuesday he would likely remain at the bank on Broadway if the protests got serious. Businesses beyond the few shut blocks of Broadway remained open, for the most part, and it was business as usual, although everyone was talking about the protests.